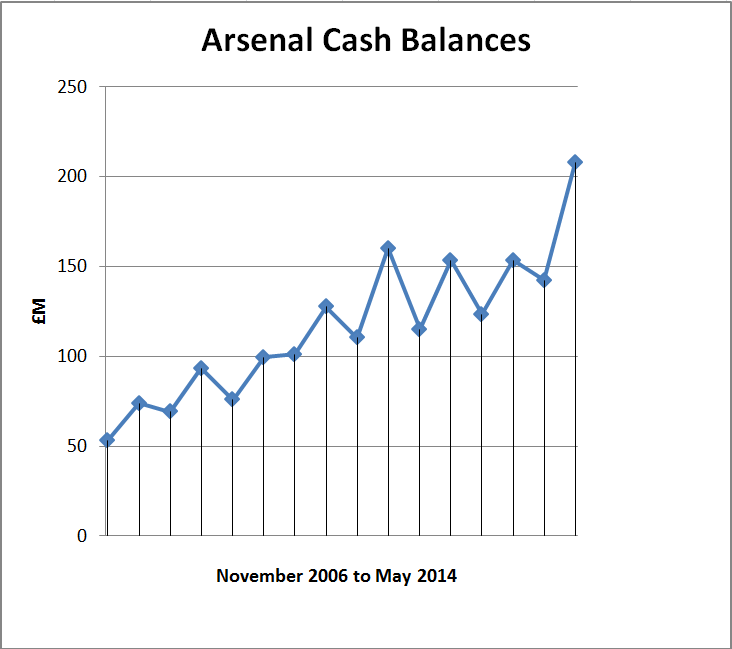 Arsenal’s accounts to the end of May 2014 are out, and the figure we all love to see is the cash balance. 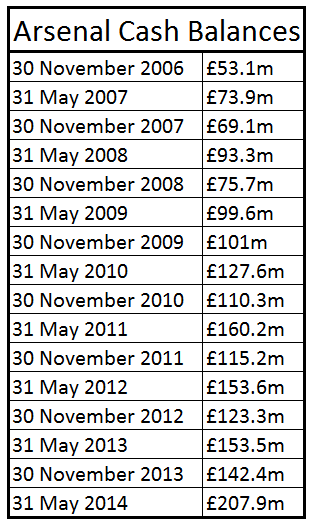 Arsenal hold by far the biggest cash balance of any Premier League club, for no apparent reason other than a generally conservative stance on the part of the Board, and a manager who is a one-off in terms of both his control over team spending and his desire to only spend when he considers he’s getting good value. There may possibly be a more sinister third factor: that Stan Kroenke is insisting on holding ever bigger amounts of cash in Arsenal in order to satisfy his creditors elsewhere that he always has a large supply of cash on tap if he should need to call on it. If it’s the third one, then it isn’t going to be spent, and we can all forget about improving the squad to a position somewhere close to the sugar daddy boys, and settle for occasional title challenges if we’re lucky. That is impressive growth by any standards. What’s the point of keeping all that cash then? Answers on a postcard to Mr A Wenger, Arsenal Stadium. ← Why Can’t Arsenal Handle Big Away Games? For whatever reason this is done, no one knows but we must insist that cash must be used to enable the team win trophies. Have you noticed that apart from November 2009, the graph goes up-down-up-down, etc? Go read Swiss rambler to find out why we have 207m in the bank and it’s not for the reason you made up. Brilliant a well run club and giving young men excellent opportunities not only in becoming players but respect able men. is diz what its all abt?.dnt u guyz think its abt time we stamped our authority over so-called emerging forces like chelsea and man city now that man utd is struggling?.